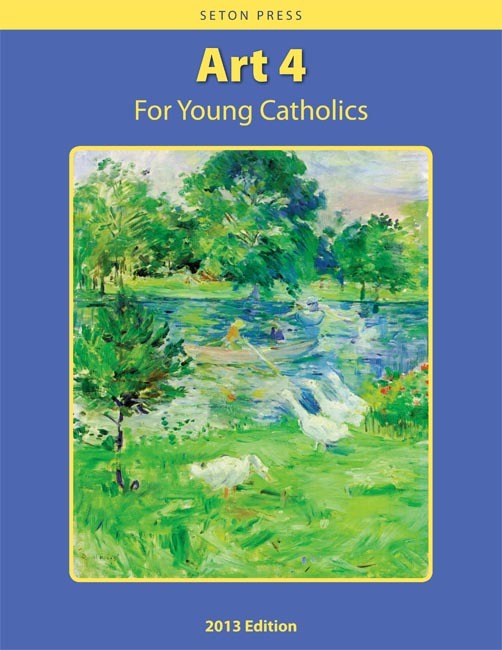 Art 4 for Young Catholics is a "How-to" art textbook by Seton Press. Experienced artists, and husband and wife, Reed and Roxolana Armstrong, share time-tested tools and methods used for centuries. Skills honed and acquired include hand to eye coordination, manual dexterity, and visual perception. They will review the drawing of the different kinds of lines, and then learn about colors and color value, harmony and contrast, dimension, symmetry, contour, texture, symbolism, balance, design, shading and more. Also contributing to the content of this text is CCD teacher Mary Rakow. 36 drawing lessons. Color. 2013 Copyright. 8.5 x 11 inches. Soft cover. 96 pp.